I play a lot of casual games on my mobile phone and part of the reason for that is because when I’m on the go, I don’t have the time to invest in a game that requires a lot of energy and effort. That’s why when I need a break from what I’m doing at work, I like to play games that will distract my mind quickly and still be satisfying in that short amount of time. Take for instance Bubblegum Hero, the latest from Crimson Pine Games. Bubblegum Hero is a simple to get into casual game that’s easy to learn but difficult to master. This is basically one of those fast reflex type games where you must blow a bubble and have its size be the size of the target ring. There is some leeway however above and below the ring which give you less points, but if you can get it exactly on the yellow ring, you’ll not only gain more coins, but also increase the score multiplier that continues as long as you keep hitting that yellow “perfect” ring. If not, it resets. There are several items you can unlock while playing such as new characters to use and new bubblegum types which have their own unique properties. Some offer score bonuses while other make it easier to score perfects. Graphically, the game looks pretty good. I really like the art style and all the characters are really well designed. It’s a very colorful, fun looking game. The only issue I have with the game is the amount of ads you’ll be watching. You’ll be watching a lot of ads if you want to gain lots of coins quickly as well as discounts on unlockables. Those are at least kind of useful. Ads will also play sometimes in-betwen games, which aren’t useful at all. You can make an in-app purchase however to remove the ads if it bothers you that much. For the most part, the ads don’t bother me too much as long as they provide a bonus for watching them. 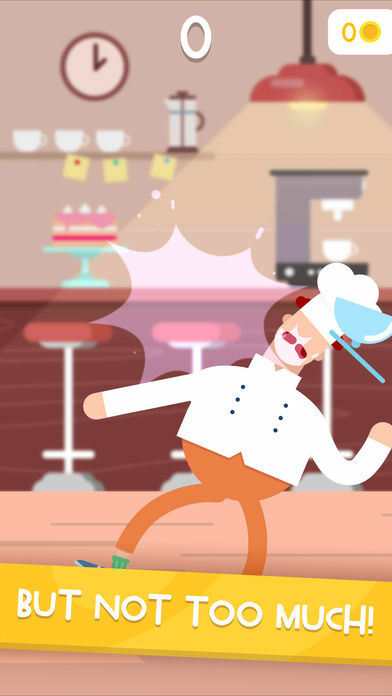 With that said, Bubblegum Hero is a pretty fun game to play around with in short bursts. Trying to get a high score and unlocking characters and gum types will probably be your main objective. This is one of those games you can definitely get hooked on. 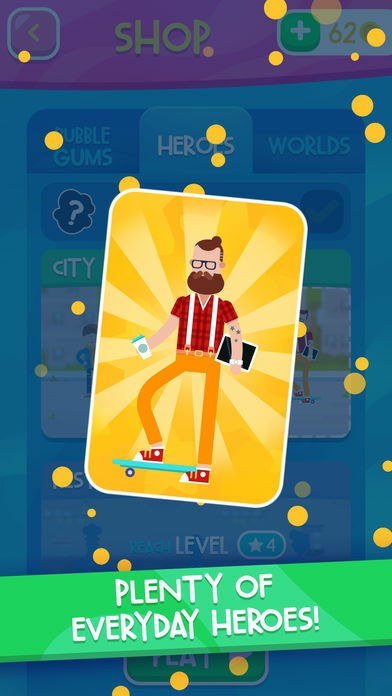 How much gum would a hipster chew if a hipster could chew gum? Who would blow a bigger balloon – a toothless granny or a sumo fighter? Don’t you think it’s about time to find out? Your main goal is to make the right bubblegum balloon. Not too small or it will flop and not too large or it will blast in your face. Make it perfect and you’ll get a combo multiplier and the leaderboard will be yours. Beware though, the higher combo you score, the more difficult the game will get! There are over 20 heroes to pick from. Each one of them is a real bubblegum aficionado and playing as a different hero is where the joy comes from. Especially when you pop the balloon and the gum blasts all over your face! As you may have expected, gums are the most crucial items in this game. On each world, you draw from a different gumball. Each of the gums has a different name, flavor, and skin, as well as properties like points, speed, perfect, range & cash. 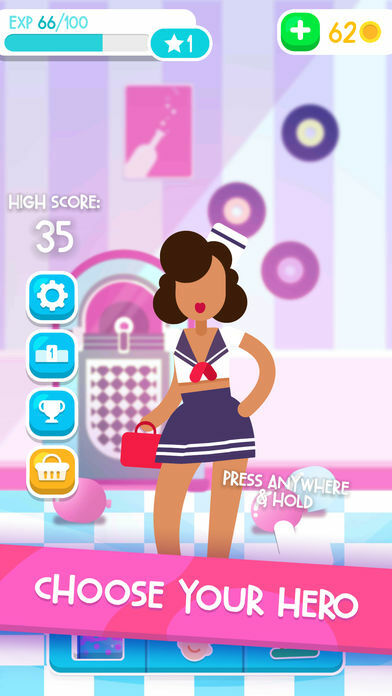 In BubbleGum Hero there’s also a ‘real life mode’! In settings, you can change the mode and literally blow into the microphone. 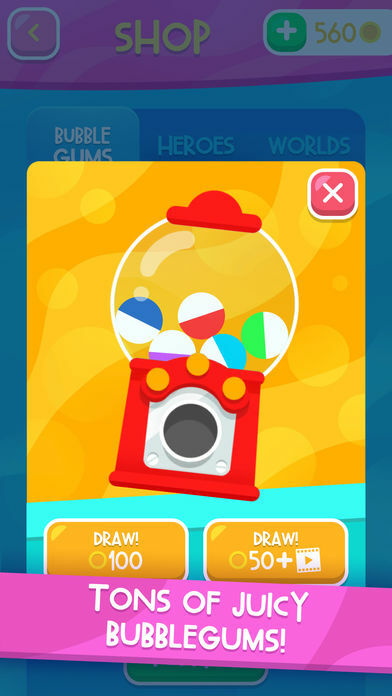 Guess what, you will blow the balloon from within the game! That’s something to show off at the next party!